In its recent investigation of chemical reactivity accidents, the US Chemical Safety Board noted a gap in technical guidance and regulatory coverage. This volume closes the gap in technical guidance, helping small and large companies alike identify, address, and manage chemical reactivity hazards. It guides the reader through an analysis of the potential for chemical reactivity accidents to help prevent fires, explosions, toxic chemical releases or chemical spills. This volume is applicable to processes at any scale and is particularly useful for chemists, safety managers, and engineers involved in scale–up. An enclosed CD–ROM provides portable checklists, analysis tools, and a list of additional references. 1.4 How to Use This Publication. 2. 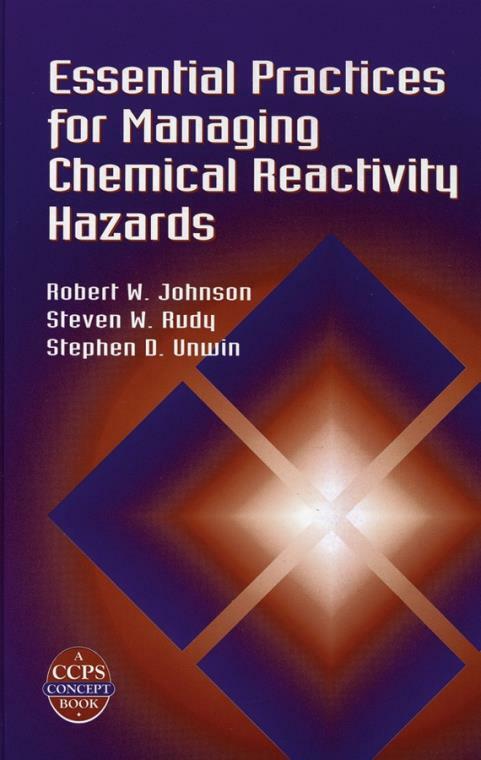 Chemical Reactivity Hazard Management. 2.1 Key Considerations for Managing Chemical Reactivity Hazards. 3. Preliminary Screening Method for Chemical Reactivity Hazards. 3.2 Mixing and Physical Processing. 3.3 Storage, Handling, and Repackaging. 4.1 Put into Place a System to Manage Chemical Reactivity Hazards. 4.2 Collect Reactivity Hazard Information. 4.3 Identify Chemical Reactivity Hazards. 4.4 Test for Chemical Reactivity. 4.5 Asses Chemical Reactivity Risks. 4.6 Identify Process Controls and Risk Management Options. 4.7 Document Chemical Reactivity Risks and Management Decisions. 4.8 Communicate and Train on Chemical Reactivity Hazards. 4.9 Investigate Chemical Reactivity Incidents. 4.10 Review, Audit, Manage Change, and Improve Hazard Management Practices and Program. 6. Future Work on Chemical Reactivity Hazards. A–2. An Inherently Safer Process Checklist. A–3. Executive Summary of CSB Investigation Report.